Allah is sufficient for me. There is none worthy of worship but Him. I have placed my trust in Him, and He is the Lord of the Majestic Throne. O Allah, guide me with those whom You have guided, and strengthen me with those whom You have given strength, and take me to Your care with those whom You have taken to Your care and bless me in what You have given. O Allah, just as You have granted me all that i've loved let those things be helpful to me in the performance of those deeds that You Love. O Allah! I ask for a heart wich is tender and humble in Your way. O Allah! I seek Your assistance to perform the deeds that You Love, and i ask for complete trust in You, and a good belief in You. Qulillaa-humma maalikal-mulki tu'til-mulka man tashaa-'u wa tanzi-'ul-mulka mimman tashaa'. Wa tu-'izzu man tashaa-'u wa tuzillu man tashaa' bi-yadikal-khayr. Innaka 'alaa kulli shay-in Qadeer. Tuulijul-layla fin-nahaari wa tuulijun-nahaara feel layl wa tukhrijul-hayya minal mayyiti wa tukhrijul-mayyita minal hayyi wa tarzuqu man tashaa-'u bi gayri hisaab. Rabbana aghfirlee wa li-waali-dayya wa lil mu'mi-neena yawma yaquu-mul-hisaab. Rabbi arhamhumaa kamaa rabbayaani saghiraa. O Lord! Love my parents as they have loved me since i was young. Allahuma allif baina qullubaina wa aslih dhata bainina wahdina subuul as-salami wanjjina min adh-dhulumati il an-nuur. O Allah! Cause Love between our hearts, and improve our mutual relations and guide us to the paths of peace and security: taking us out of darkness, and guided towards the Light(of faith). Allahuma aghfirlana wa lil mu'minina wal mu'minaati, wa aslih-hum, wa salih dhati bayynihim, wa allif baina quluubihim, waj'al fi quluubi himul imaana wal hikmata, wa ansurhum 'ala 'aduw-wika wa 'aduwwihim. O Allah! Forgive us, and the beleiving men and women, and remove their faults, and cause peace and love among their hearts, and infuse into their hearts a firm faith and wisdom, and let them be voctorious over Your enemies and their enemies. O Allah, i hope for Your Mercy, do not leave me to myself even for the blinking of an eye. O Allah, verily i ask You for the best supplication and the best success, and the best deed and the best reward. There is none worthy of worship but Allah Alone, Who has no partner. His is the dominion and to Him belongs all Praise, and He is able to do all things. Glory be unto Allah. Praise be to Allah. 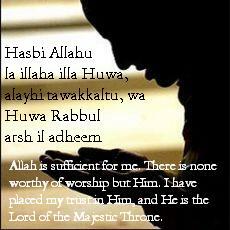 There is none worthy of worship but Allah. Allah is theGreatest. There is no Might and Power except by Allah's leave, the Exalted, the Mighty. My Lord, Forgive me. O Allah! You are my Lord, there is no deity but You, You created me and i am Your servant and i am trying my best to keep my oath(of faith) to You and to seek to live in the hope of Your Promise. I seek Refuge in You from my greatest evil deeds. I acknowledge Your Blessings upon me and my sins. So forgive me, for none but You can forgive sins. O Allah! Save me from the fire.